Do hidden messages in the Bible prove it was written by an all-powerful God? Learn how the Bible Code can produce hidden messages from any text, in a Nov./Dec. 1997 Skeptical Inquirer report by NMSR President Dave Thomas here, in a followup report by Thomas from the March/April 1998 Skeptical Inquirer here. 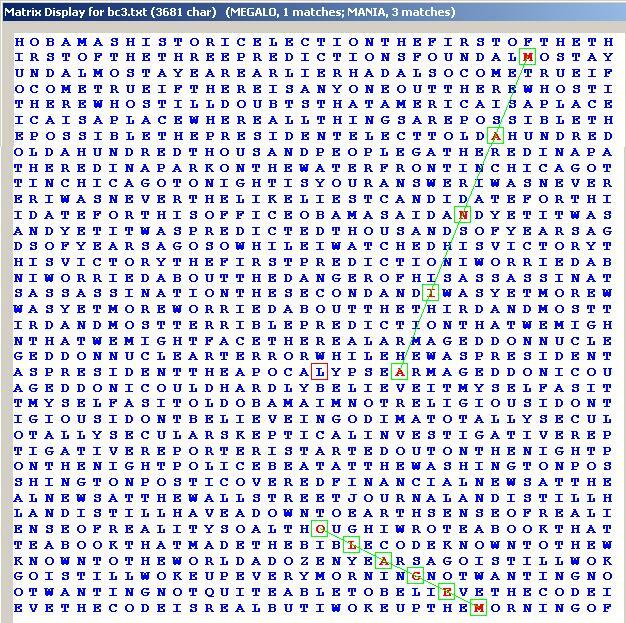 Download the PDF file with the complete talk "The Bible Code – Data Mining for God", as presented at The Amazing Meeting 4, here. It's Ba-a-a-a-ack! The Bible Code III! Do these codes mean anything? Of course not! They just serve to show how easily hidden messages can be produced in any text, not just the Torah. I searched for MEGALO-MANIA because I suspect that Bible Code III will be just more of Drosnin's megalomania that was so overdone in Bible Code II. The man really thinks he's the one individual who can save the World! the "George Harrison Cluster in War and Peace"
Don't miss mathematician Brendan McKay's excellent Torah Codes Site! Read ABC News' John Allen Paulos discussion of the NMSR president's Bible Code discovery of Roswell in the book of Genesis here; read a discussion on the Bible Code from the Wall Street Journal here. Read Mark Perakh's Bible Code excellent Bible Code articles here and at www.talkreason.org. Looking for dirt on Grant Jeffrey? Check out this article by Mark Perakh. Here's an article that mentions Roswell in King James Genesis. Tim Boettcher finds Bible Codes in the Skeptic's Dictionary! June 13, 2003: James "The Amazing" Randi mentions this very page! "...This explanation is priceless, and wipes out Drosnin with laughter, which is the correct weapon to use here. ..."
Thanks to Michael Shermer and Scientific American, for referencing and linking to this very page! (June 2003 issue, page 35). Shocking New Codes Found in Drosnin Sequel! "THE BIBLE CODE IS A SILLY, DUMB, FAKE, FALSE, EVIL, NASTY, DISMAL FRAUD AND SNAKE-OIL HOAX." Dave Thomas will Hammer Drosnin's New Book! Suggestions for inclusion of "DISMAL," "FALSE" and "HAMMERMAN" kindly supplied by Brendan McKay. "And I never thought to look in tHe code fOr 'airplAne.' As I eXplained to a friend at the CIA later that day,..."
MORE SHOCKING CODES IN DROSNIN'S APPENDIX!! I also looked for secret messages in Drosnin's Appendix. And, running right through his assertion that "
to this day, no one has found any evidence that Rips is wrong" is the hidden message FALSE. What has Drosnin learned in five years? Sadly, not a thing... Read On! Bob Novak discusses the Bible Code with Drosnin on CNN Crossfire, December 2, 2002. See what Drosnin is calling "noise" - a successful prediction, based on secret codes in War and Peace, of the 1998 NBA champs, made months in advance! I have already been asked by several people if I have found "Bible Codes" related to the September 11th terrorist attacks on New York, Washington D.C., and elsewhere. Since the "Bible Code" is simply an arcane mathematical technique which allows the user to "harvest" detailed "predictions" of ANY EVENT, using ANY TEXT, then of course, after-the-fact predictions of the terror attacks can be found in the Torah, or in War and Peace, or even the Albuquerque Telephone book. Any message can be derived from any text. Out of respect for the victims of these terrible acts, and for their families, I will NOT be searching for code "predictions" of these events, in any text, now or at any time in the future. In 2000, a nice lady from Louisiana, "Dee," asked me if I had ever looked for my own name in the Torah. "There's an idea," I thought. What she really wanted was for me to look for her name in the Torah, but that didn't come out till later. The fact that the Bible Code can be used to find any message (in any text) means that any John Doe can find himself in there. And if John Doe is a believer, the thought that even he is mentioned (secretly) by God in the Bible is appealing indeed. I resurrected my trusty code programs, and learned how to spell "David Thomas" in Hebrew. I launched the search, and found several instances of my name encoded in the Torah itself. One of these was located entirely within the first book, Genesis; this appears below. Here, the Hebrew letters spelling "DAVID THOMAS" run from bottom to top. "David Thomas" in the Book of Genesis. Of course, I didn't stop with the Torah. I looked for myself in Charles Darwin's classic Origin of Species, and found my name in there too! When I told Dee about that, she replied, "Maybe that's just how Jesus says 'Look, even here.' " I then told her about a Muslim who found coincidences with the number 19 in the Koran, and how he felt those proved that only the Koran is Divine. I told her I had found mysterious 19 coincidences, not in the Koran, but in Ted Kaczynski's Unabomber Manifesto. I asked her how she would respond to my Muslim correspondent if he dismissed the Unabomber's number-19 coincidences by simply claiming "It's Allah's way of saying 'Look, even here.'" I don't think I heard from her again after that. "David Thomas" in Darwin's Origin of Species, chapter 1. As my wife and I were driving through New Mexico, on Sunday, June 14th, 1998, we listened to game 6 of the Chicago Bulls/Utah Jazz National Basketball Association (NBA) playoffs. As the game drew to a close, we heard the Utah crowd groan as Michael Jordan sank the winning basket. And then and there, a chill went down my spine. "Oh my God...," I thought to myself. "The Tolstoy Code is real." Fifty days (more than 7 weeks) before, on April 27th, 1998, I had undertaken a search for NBA teams and players using the technique of 'equidistant letter sequences' popularized in the book The Bible Code, by Michael Drosnin. (One of Drosnin's strongest claims in support of the Bible Code was that his code-based prediction of the assassination of Israeli prime minister Yitzhak Rabin was made a year before the event took place.) Unlike Drosnin, however, I wasn't searching in the Hebrew Torah -- instead, I was looking in book one of an English translation of Leo Tolstoy's epic, War and Peace. I had wondered if the NBA playoff winner could actually be predicted in advance. What did my April search reveal? CHICAGO was found encoded just once in War and Peace, at a step of 8891 characters (and therefore 100% 'minimal,' i.e. having the shortest step for that word). Ominously, "JAZZ" was NOT encoded at all. But there was more! "BULLS" was also encoded 32 times in Book 1 of War and Peace, and of these, five matches had non-zero domains of minimality. Amazingly, "CHICAGO" and one of the minimal (shortest-step) "BULLS" appeared close to each other in a classic "Bible-code" crossword puzzle. I also found 14 hidden occurrences of "JORDAN," and one of these (minimal step, of course) made an excellent, small puzzle with one of the minimal "BULLS." With all these "Bible Code" indicators flashing -- matching of long words, proximity of paired matches, and strict use of "minimal" matches -- I rushed to send my prediction to several reporters and scientists. I thought about trying to warn Karl "the Mailman" Malone of the Jazz --- but I decided to let history run its course. When I made my prediction, there were 16 teams in the playoffs. And the Bulls, while favored, almost lost it all on more than one occasion. In fact, the Indiana Pacers came very close to defeating them, but Tolstoy's Bulls clung to their destiny. And on June 14th, my prediction came to pass. Not only had Tolstoy predicted the victors would be the Chicago Bulls, but Jordan's key role in the victory had been forecast -- almost two months in advance. And now, we are left to ponder the somber truth. ...or, Leo Tolstoy is the Supreme Being who created the Universe. One of the chief arguments employed by proponents of the Bible Code is to mention that the original code proponents, Witztum, Rips and Rosenberg, published a paper supporting the phenomenon in the journal Statistical Science in 1994, and that, to date, no rebuttal has ever been published there. But just such a paper, authored by Brendan McKay, Dror Bar-Natan, Maya Bar-Hillel and Gil Kalai, has finally been published in the May 1999 edition of Statistical Science. The authors show definitively that the secret of the codes lies not in any special properties of Genesis, but rather in methods by which the lists of modern names and dates were chosen. In other words, the data (the text of Genesis) was not altered or modified, but the choice of the experiments (e.g. the list of famous rabbis and measures of closeness) completely determines the results. McKay and his co-authors also show that several very reasonable measures of code effectiveness, much less convoluted than the complicated one chosen by Witztum and Rips, show no trace of the alleged "encoding" in Genesis or other books of the Torah. The article, and many others, is available on the web at McKay's excellent site (see specifically the page at http://cs.anu.edu.au/~bdm/dilugim/StatSci/ ). Mckay's article, at almost 40 pages, is much more detailed and rigorous than the original paper by Witztum, Rips, and Rosenberg, and contains a detailed bibliography. Drosnin's claims are so sensational that they can be dismissed rather easily. The claims of the original Israeli mathematicians are much more difficult to understand, and also to disprove. We are indeed fortunate that McKay and colleagues have published their extensive and devastating research on the codes of Rips and Witztum. If "Bible Codes" are really inspired by the Judeo-Christian Deity, then how does one explain these negative codes, which have all been found as official ELS "messages" in the Torah? --Jehovah is dead--occurs hundreds of times in the Torah. --There is no God--occurs 5 times in the Torah. "Ashland - A Hebrew scholar and a mathematician have found what they call one of the most significant discoveries in the field of Bible code research. Nathan Jacobi, an Ashland scientist and Hebrew teacher, found a seven-word sentence encoded in the Old Testament book of Isaiah. 'Everybody I've shown it to thinks it's phenomenal,' said Jacobi. The longest code to date had been 13 letters long. The chances of finding a sentence-length code in a Hebrew text is one out of 685 billion times 1 billion,said Ed Sherman. He owns an Ashland firm that runs insurance statis-tics for several fortune 500 companies. Jacobi and Sherman's newest code is Shakak Meal Yeshua Shmi Az Sasu Avim, which is translated into 'Gushing over Yeshua was my mighty name and the clouds rejoiced.' Yeshua is the commonly agreed-upon name for Jesus, Jacobi said. The code was found in Isaiah 53, a text that prophcies the coming of Jesus Christ as messiah. Scholars attribute the text to a prophet who lived six centuries before Christ was born." On October 17th, I contacted Bible Code expert Brendan McKay in Australia about the "stunning" new code. McKay told me "Funniest thing about it is that the supposed 22-letter ELS does not actually exist. I tried 4 different editions of Isaiah and all of them have the last required letter out of place by one. With only 21 letters it falls apart (plural changes to singular then the verb doesn't match, etc.). Also, the Hebrew is appalling, according to my Israeli friends. In any case you can read the same sequence of letters in lots of ways. ..."
McKay supplied some actual alternative translations of the sentence in question, including adding a letter at the beginning with the right skip. These translations are far from what was claimed by Jacobi and Sherman - so far, in fact, that I chose not to present them so as not to offend our Christian browsers. 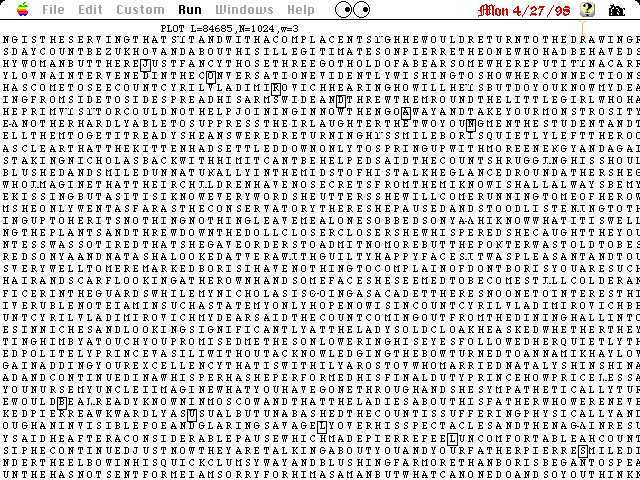 Bible Code Movie a Flash in the Pan? The new movie "The Omega Code," starring Michael York, is a millennial thriller based on the premise that the "Bible Code" is real. The movie had a good first weekend in mid-October, with $2.4 million in sales, and an average of $7,700 per screen. It has been advertised mainly through churches and word of mouth. By the next weekend, only two more screens were added, and earnings fell 32% (25% is considered normal). "Mr. ShowBiz" predicts that the film will be lucky to even break even; the production cost $7.2 million. Mr. Showbiz also notes that the producer of the film "wanted to have it playing in 450 theaters by the end of November. At this point, the likelihood seems to be that Code may not be in theaters at all by then." There have been several interesting developments in the Bible Code saga since last month's report. o Aussie mathematician Brendan McKay e-mailed me the outline of a much faster search algorithm, which I incorporated into my own code program. It is tens of times faster, and allows me to search for all possible step sequences. It is faster than my brute-force approach (checking all possible equidistant letter sequences) because it's more like the way you can find short words by inspection of the puzzles. You focus on those letters of the text that match the first letter of the desired hidden word, and then find letters matching the second letter of the desired word. For each two-letter pair, check the location of the third letter in the pattern; if it matches your desired word, keep going, otherwise move on to the next pair. o I have derived, with John Geohegan's assistance, a formula for how many occurrences of given words you would expect to find in a text of a given number of random letters. You must calculate the probability of selection for each letter, which depends on the particular text being examined. This is just the number of occurrences of the letter divided by the total number of letters. Typically, the probability for getting an "E" is above 0.1, while that for a "Q" can be just 0.005. For a given word like "Roswell," you multiply the chances for an "R" with that for an "O", then an "S," and so on. The final product is multiplied by the total possible number of equidistant letter sequences for the word, which is roughly the square of the number of letters in the entire text divided by one less than the number of letters in the candidate hidden word. This formula works quite well. I estimated that I would find 18.7 occurrences of "Clinton" in War and Peace, Book 1 (212,000 characters, 7.5 billion possible 7-letter equidistant sequences); the actual number was 21. I estimated I would find 128.1 matches for "Apollo" - and got 129. For "Moon," I estimated 150,283, and found 151,704. With each additional letter in candidate words, the chances fall, because you must multiply your product by another number invariably less than one. And rare letters reduce the expected matches greatly. o People Magazine has picked up the chase, and reporter Michael Haederle asked me if I had looked for hidden messages in Drosnin's book. I replied "Hmmm..." Shortly thereafter, I downloaded the chapter excerpt of Drosnin's book The Bible Code from Simon and Schuster's web site, and began searching away. Even though the chapter was only about 4,000 characters in length, I was able to produce a number of hits. One puzzle held a lunar theme: space, lunar, craft, and several "moon"s, all authentic hidden words. I found the ubiquitous "Hitler/Nazi," even though the excerpt did not mention those words directly, talking instead mainly about the Rabin assassination. 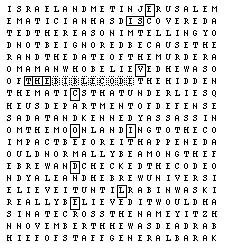 One puzzle has the hidden message "The Code is a Silly Snake-Oil Hoax." Oh, and I found "The Code is Evil" hidden in Drosnin's book (mixed message he's sending us here...). "The Code is Evil," hidden in The Bible Code by Michael Drosnin (Simon and Schuster, 1997). o Drosnin has been stumping Australia, flattering code-buster Brendan McKay with compliments such as "clown," "liar," "fraud," and "like a baby just learning to talk compared to the world-famous Professor Rips." But Drosnin is also attacking McKay because McKay's puzzles allegedly don't have "minimality." Not only must hidden words appear close together in a puzzle - they must also be the shortest skip distances for the given word in a fair-sized portion of the text. Drosnin only mentions "minimality" in passing, buried in the chapter notes at the end of his book: "All of the Bible code print-outs displayed in this book have been confirmed by statistics to be encoded beyond chance. 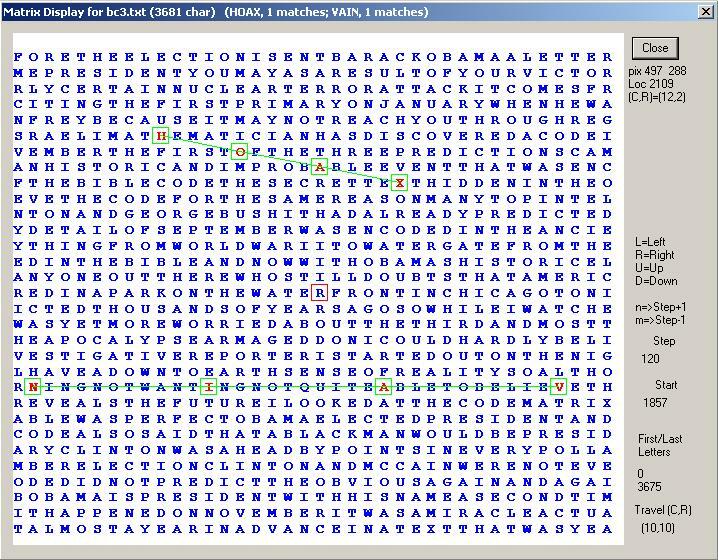 The word combinations are mathematically proven to be non-random...The computer scores the matches between words, using two tests -how closely they appear together, and whether the skips that spell out the search words are the shortest in the Bible. (For a more detailed explanation see Appendix.)" o I fetched the Torah (Koren edition) from McKay's web site, and modified my program to handle the Hebrew characters via the Michigan-Claremont transliteration scheme (in which, for example, the Hebrew letter Shin, , is represented as $). I have since reproduced a number of Drosnin's puzzles, including the non-minimal "Clinton/President" match. o Amazingly, Drosnin found Shoemaker-Levy (transliterated as $WMKRLWY, 8 characters), not in the 5 books of the Torah, but in Isaiah. Eliyahu Rips used Isaiah as a control, an example of an ancient Hebrew text without the "code," and found no unlikely codes therein. Drosnin also found "computer" in the book of Daniel. Perhaps he forget that the "Code" is supposed to occur only in the five books of Moses: Genesis, Exodus, Leviticus, Numbers, and Deuteronomy. The Nov. 3rd 1997 issue of People Magazine had a 2-page article on the Bible Code, including pictures of me, colleague Brendan McKay, and author Michael Drosnin. Most of the work was done by Albuquerque free-lancer Michael Haederle. Also, Eric Zorn of the Chicago Tribune did a nice piece on the codes in the Oct. 27th issue, available on the Web at [link expired sorry!]. This site has great links to many code pages, including John Fleck's Journal piece. I searched Zorn's past editorials to see if he had predicted the very recent disgrace of an alderman named Huels. He had, all right! During the search, I also came across the best ELS (equidistant letter sequence) I have found to date: if you have ever committed the word "generalization" to print, you have created a hidden code about the Third Reich! Behold, at a step of three, the Nazi: geNerAliZatIon. And because the step is so small, this match has super "minimality" used to grade puzzle matches. Watch what you write, people!